Taxi Transfers for Mobile World Congress. Book your Taxi in advance. Executive Taxis for GSM Mobile World Congress atendees. Schedule your departure time and book now your Minivan Taxi for the Airport. GSM Mobile Congress offers transportation to all points of the city. Book your Taxi for smooth ride through the city. Comfortable and safe without delay. Travel safely with our executive taxis for GSM Mobile World Congress. Profesional taxi drivers in Barcelona with high standard and accomodation. Call now and schedule your taxi in Barcelona. We have the best car with all amenities. Book our big Taxis to move all your luggage to and from the Hotel. Avoid setbacks and surprises when moving your luggage. Call now TaxiBarcelona BCN and request a Taxi. We are your taxi company in Barcelona 24 hours. Taxis transfers with spaciuos and confortable vehicles for most exigent customers and atendees of GSM Mobile World Congress in Barcelona. Barcelona Taxi BCN provides best taxi service with professional and multilingual taxi drivers. Taxi in Barcelona with English speaking drivers. More than 10 years of Taxi professional service in Barcelona and companies recognition as Best Taxi Company in Barcelona makes us your best transfer company. Schedule your Taxi in advance and you will avoid all Taxi waiting lines to move in and out Mobile World Congress 2012. You can Book a Taxi in Barcelona in advance to be picked at the right time with no delays and long waitings. Subway lines of Barcelona has annouced possible strike for the same days of GSM Mobile World Congress so it could be hard to get at your appointments on time. Don't let last minute news ruin your agenda. Book in advance our personalized Taxi Service for GSM Mobile World Congress atendees. As a Company or individual you can purchase in advance as many trips as you may need. We calculate the average distance and give you a close price taxi service. Payment secure ONLINE and pre-booking accepted in our web page. Taxi transfers in Mobile World Congress 2012 with best and confortable cars. 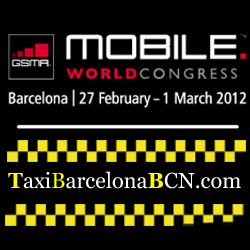 We provide professional taxi service and transfer solutions to all companies attending GSM Mobile World Congress 2012. Check our services to individuals and companies.